One of history's greatest heroes goes up against history's greatest monster this weekend at the box office. You have your decision to make, people. This weekend brings to the end one of the most ridiculous film franchises ever to make over a billion dollars cumulatively, with The Twilight Saga: Breaking Dawn Part 2. The life of this franchise got extended by about a year when the decision was made to notice that Harry Potter doubled the box office for the last book by splitting it into two movies. “Hey,” said Summit Entertainment, “we have absolutely nothing else coming down the pipe, so we might as well keep this going as long as we can.” And so here we are, with a fifth, and one supposes, final film of this ridiculous vampire opera about passive-aggressive relationships and keeping the wimmenfolk in their place (Of course, we still have The Host and the inevitable 50 Shades of Grey movie so to come, so we're not in the clear just yet). When last we left this story, Bella had just been transformed into a vampire after dying during childbirth and a werewolf imprinted on her newborn baby because it's his soulmate and... wait. What the hell? I mean, Jesus. That's screwed up. Apparently this is worth a $138 million opening weekend. Anyway, moving on... Apparently, this results in the start of some sort of vampire civil war, or maybe they're just as squicked out as the rest of us by those turns of events. Cue big climactic battle scene and then OMG! 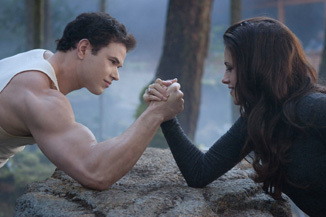 No more Bella and Edward! The important thing is that we got one more manufactured tabloid story about the totally-real-no-I'm-serious-stop-looking-at-my-P.R.-agent real-life “relationship” between Kristen Stewart and Robert Pattinson. And hey, it's only a couple more months before we can all start forgetting we knew what a Taylor Lautner was!